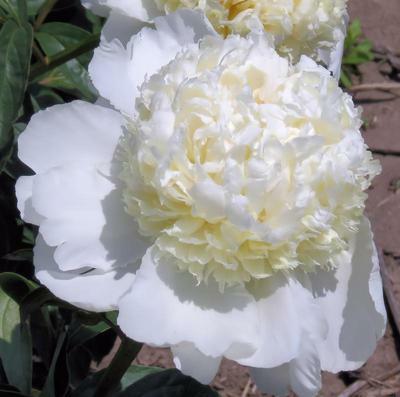 Bomb double; large, guard petals pure white, center ball cream fading to white with age. Attractive flower shape, builds high, petals of good substance. Robust, dependable, and satisfactory to increase in our Midwestern climate. Attractive in the garden, requires support for best show. Good cut flower qualities, maintains quality in cold storage, buds open fully and without trouble.